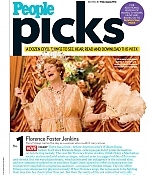 While “Florence Foster Jenkins” is still being shown throughout the United States, the film has been released on DVD, Blu-Ray and on demand in the United Kingdom, where it was theatrically released in May. Be sure to grab your copy if you haven’t seen it yet / if you’re able to play European region DVDs. Having received my copy just in time, over 1.600 Blu-Ray screencaptures have been added to the photo gallery. Enjoy! Lots of additional pictures from many of the past day’s events have been added. 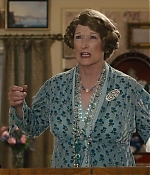 Besides the New York premiere for “Florence Foster Jenkins”, a screening was held in the East Hamptons on Monday to kick off the US promotion of the film. 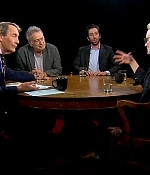 On August 10, the cast has attended several Q&As for BAFTA New York, the SAG/Aftra Foundation and appearing together on “The Charlie Rose Show”. 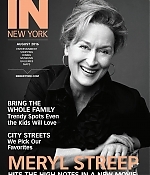 Also on August 10, Meryl gave a very insightful and entertaining interview at Times Talks. Check out the next update for video additions. All added pictures can be found below. 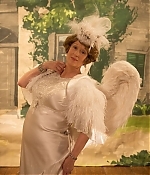 A big batch of additional production stills and on-set pictures from “Florence Foster Jenkins” have been added to the photo gallery. 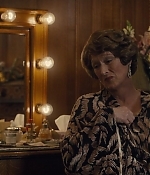 Also, UK fans will have to wait less than a month to own the film on home video. 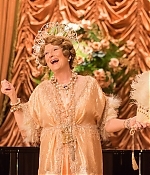 After its theatrical release in May, “Florence Foster Jenkins” will hit the UK market on DVD and Blu-Ray on September 05, 2016 – only weeks after the film’s US release. 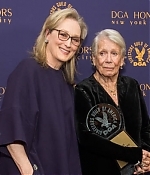 Still, there she was Saturday, alongside her former Yale Drama School classmate John Shea at a benefit for the Theatre Workshop of Nantucket. 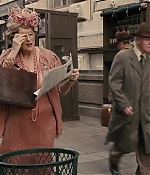 (Surprisingly, it was Streep’s first time on the island.) The handsome Shea, who’s perhaps best known for playing Lex Luthor in the ’90s TV series “Lois & Clark: The New Adventures of Superman,” got his start as a TWN apprentice in 1968 and has remained ever grateful. TWN, which had no rivals when it was founded in 1956, had fallen on hard times before Shea took the reins as artistic director seven years ago — for the munificent fee of $300 per season, according to his wife, sculptor Melissa McLeod. 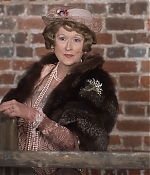 Saturday’s benefit drew some 240 high-rollers to the Nantucket Hotel’s ballroom at a cost of $2,500 per person — and $50,000 for the privilege of booking Streep’s table, a fee gladly forked over by prominent DC lawyer (and TWN board member) Max N. Berry. 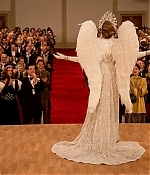 Other high-profile attendees included film producer Armyan Bernstein, who directed Shea in 1984’s “Windy City” (and followed his friend’s lead in acquiring a summer home on the island), and benefactress-about-town Wendy Schmidt (wife of Google ex-CEO Eric Schmidt), looking Titania-like in a sleek silver-beaded silk chiffon shift. 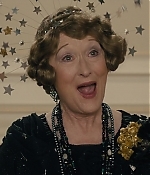 Streep’s contribution to the cabaret show, performed with Shea and their fellow Yale classmate Joe Grifasi, was a silly spoof of “Medea” penned way back when by then-fledgling playwrights Christopher Durang and Wendy Wasserstein. 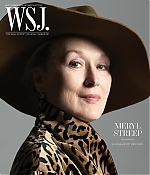 Here comes a great new interview from the September issue of the Wall Street Journal, accompanied by a stunning pictorial by Brigitte Lacombe: When Meryl Streep steps from her limousine onto the red carpet in London’s Leicester Square, everything about her comportment—as she strikes poses with castmates Hugh Grant and Simon Helberg, greets fans along the stanchions and hugs past co-stars like Stanley Tucci who’ve turned out for her—announces that she’s been here before. 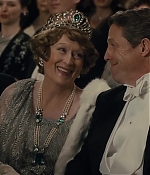 “It’s quite a scene, isn’t it?” she later says about the glittery film premiere. “It doesn’t get old. 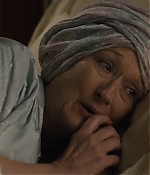 I mean, who gets to see a movie with 1,600 people?” With her hair in an elegant but simple updo, Streep confidently strides the red carpet in a black silk jumpsuit, heeled ankle boots and a long, beaded statement necklace. 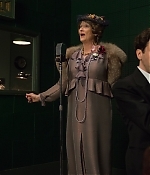 As she reaches the entrance to the theater, the emcee for the event introduces the star of Florence Foster Jenkins to a cheering crowd. 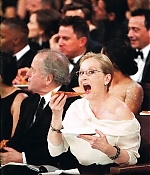 He then asks her, “We know you can sing, because we heard you sing in Mamma Mia. So how difficult is it to sing badly?” She smiles. “Surprisingly easy.” The complete article can be read over at The Wall Street Journal. 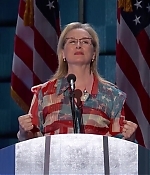 Everytime my emails are flooded with expletives and “I’ll never watch any of your movies again”, I know that Meryl Streep has been possibly doing something political the day before :-) On Tuesday, Streep has attended the Democratic National Convention Tuesday night to draw attention to the historic moment of Hillary Clinton’s nomination for president, the first time a woman has earned the honor for a major political party. “What does it take to be the first female anything? 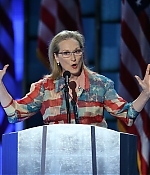 It takes grit and it takes grace,” Streep said. 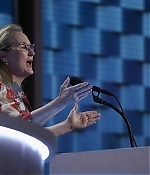 In her praise of Clinton, Streep mentioned that the Democratic nominee “has taken some fire over 40 years, over her fight for families and children. 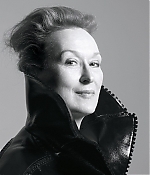 Where does she get her grit and grace?” While celebrating other famous female firsts throughout American history, Streep also focused on the road ahead — and beyond.”You people have made history, and you are going to make history again in November, because Hillary Clinton will be our first woman president,” she told the crowd. 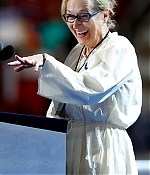 “She will be the first, but she won’t be the last.” Her speech can be watched in the video archive, screencaptures and pictures from the convention and the rehearsals have been added to the photo gallery. 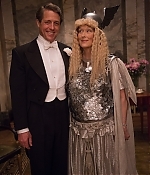 Yesterday, Meryl Streep, Hugh Grant and Simon Helberg have attended the New York press conference for “Florence Foster Jenkins”. 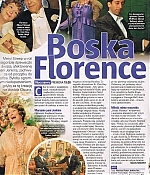 The film, which has had a successful run in the United Kingdom back in May, will premiere in US theaters this August. Besides a couple of pictures, a full video from the press conference has been added as well. The video can be watched here. 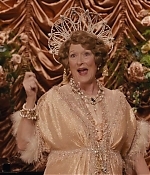 Also, a video transcript of the DGA Theater Q&A for “Florence Foster Jenkins” with Meryl Streep and William Ivey Long has been added as well. Edit: Pictures from the New York Screening and Q&A have been added, with many thanks to JustJared. 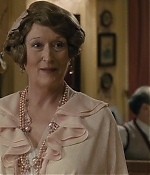 I’ve spent the week without an iternet connection, so most plans for “The Devil Wears Prada” related updates fell flat. 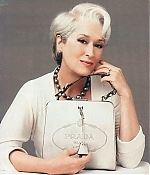 But, as Miranda Priestly would have said, “Details of your incompetence do not interest me”. 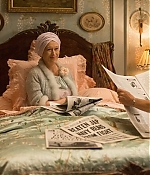 So, a nice btch of additional production stills and promotionals from the film have been added to the photo Gallery. Many thanks to Marci for helping me with this one.